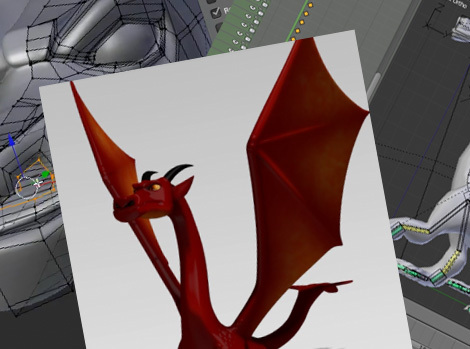 David Ward's Creating a Stylized Dragon using Blender 2.5 series is now complete. In this multi-part series, I’ll be covering how to box-model a stylized dragon, making heavy use of the various sculpt tools. The texturing will cover creating tangent normal maps and using the “toon shader” to get a nice cel-shaded look. I’ll also go into some intermediate rigging with some nice animations; from walking to pouncing to flying. and finally we’ll look into setting up a good composition with props and lighting. "’ll also go into some intermediate rigging with some nice animations; from walking to pouncing to flying." It doesn't cover the face rig? No, he didn't really use that one. But I don't think, a dragon like this is the best point to discuss face-rigs... The face rig wasn't too detailed anyway. Merely jaw and most basic eye controls. Anybody knows at wich part he's doing the body rig? The short descriptions tell you, that he starts the rig in part 7, not directly at the beginning though. Hmm, I just noticed that the links need some fixup for now. He doesn't link from every video to every other one yet. Anyways, I like more general tutorials, so that I can use the shown techniques with other meshes as well. So the whole modelling part seems a little bit redundant to me. But I guess it's quite useful to others. This is an awesome series, Thanks David and Blendercookie! I have a question. I see on the site they ask 10$ for login/download the video files in the mov format. What is included in these 10$? All the parts or just one part? Thanks. The $10 is for a Citizen membership; that's a monthly fee that you pay to "log in and download" whichever tutorials you like, rather then doing the $4 per each one.